Is an Allowance Spoiling Your Kids? You are here: Learning Center » Home and Family » Is an Allowance Spoiling Your Kids? When it comes to whether or not you should give your child an allowance, parents’ beliefs are all over the spectrum. Some believe an allowance is the only way to teach your child about responsible spending while others claim that an allowance will spoil your child. Who is right? 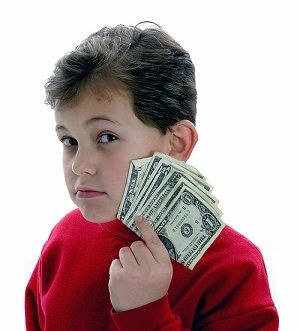 Is an allowance spoiling your kids? Before I had children I was convinced that there was a right way to parent and a wrong one. Then my little girl arrived and suddenly all my views of parenting were turned on end. Maybe an allowance is spoiling your kids, but in a different situation a lack of allowance could cause the same destructive damage. Teaching your children about money, just like every other parenting choice, is very subjective. What works for one person might not work for another. That said, it is important to give your children the right sense about how to handle money. Here are some tips for teaching your children, whether or not you choose to offer an allowance. When should you start teaching your child about money? At five? Six? Even before you start sitting your child down and talking about money they are learning about it through your actions and example. Start teaching your child about money from an early age. The sooner you start teaching, the sooner they can begin to understand the value of money and where it comes from. Different financial lessons will be appropriate at different stages in your child’s life. A two or three year old may be able to understand, “We aren’t going to buy that today,” while an older child might benefit from learning about budgeting at the grocery store or learning how he has to forgo one luxury in order to be able to get another. Are you a spender or a saver? Odds are your child will learn their spending patterns from you. Set a good example for your child by showcasing responsible spending. Let them see you paying bills, searching for bargains and visiting the bank. It might not seem like you are teaching them, but every time you interact with money, you teach your child by example, whether or not you intend to. Our struggling economy is a great reminder of the importance of saving. Teaching your child to save from an early age will better prepare them for life and a sound financial future. One of the first things I bought for my child was a piggy bank. This wasn’t just a cute décor piece for her bedroom, but a representation of the importance that I plan on placing on saving as she grows. I grew up in a family of three children and financially we are nothing alike. I am sure that this phenomenon exists in many families around the country and the world. One of the best ways to teach your child about money is to tailor your teaching to your child’s unique needs. Learn what strategies will be effective for each child and then put them into practice. For example some children are highly motivated by objects like a new video game system or outfit. These children may learn to save by working to earn enough to make their desired purchase. Other children love to save and may benefit from parental advice and guidance on investing or the stock market. You know your kids; don’t feel like you have to conform to someone else’s financial ideas. Teach your kids to be smart about money, but teach them in a way they will understand. The allowance debate is a hot topic in the parenting world, but more important than whether or not you give your child an allowance is taking the time to teach your child about money.